Are you considering working, volunteering, traveling, or doing something else before attending law school? If so, how can you use that time effectively to improve your applicant profile? Do you want to know more about going straight through to law school after undergrad? 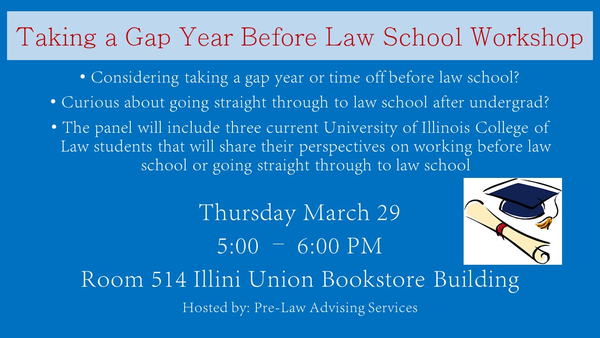 This event helps students explore different paths to law school. The panel will feature three current law students–two with work experience and one who went directly from undergrad to law school–to answer your questions and discuss the pros and cons of going straight to law school versus taking a gap year (or more) and working. We will also discuss our overall applicant data and share more details about other paths our students and alumni have taken to law school. Whether you are planning to take time off or going straight through, this is a great event to clarify what to expect on your path to law school. First Year Law Student’s Perspective: Brittany Wiegand is a 2009 graduate from the University of Wisconsin – Madison with degrees in Political Science and Philosophy. Brittany also has a Master’s Degree in Education from Louisiana State University. After undergrad, Brittany joined Teach for America as a teacher. Brittany was a Teach for America corps teacher for two years, and then she worked at various charter schools as a teacher for six years. Brittany began law school at the University of Illinois College of Law in the Fall of 2017. Second Year Law Student’s Perspective: Will Hrabe is a 2014 graduate from the University of Illinois at Urbana-Champaign. Will graduated with a degree in Political Science and a minor in Disability Studies. After undergrad, Will worked as a litigation project assistant for Kirkland & Ellis in Chicago for two years. Will began law school at the University of Illinois College of Law in the Fall 2016. Third Year Law Student’s Perspective: Lydia Faklis graduated from the University of Illinois at Urbana-Champaign in May 2015 with a degree in English and minors in Business and Communication. Lydia began law school at the University of Illinois College of Law in the Fall of 2015. Posted on March 28, 2018 by bbv@illinois.edu. This entry was posted in Events, Graduate School Information, Pre-Law. Bookmark the permalink.